Now available on steam! Soon available on other platforms (Mac, Linux). Planetoid Pioneers is a 2D physics-based action-adventure driven by User Generated Content and inspired by the classic action/exploration games Blaster Master (1988) and Exile (1988). Built in conjunction with Data Realms. Eets has been released! Eets is a Puzzle/Platformer for the PC and Macintosh. Lovingly crafted by the gang at Klei Entertainment we proudly brought this lovely game to the Macintosh. 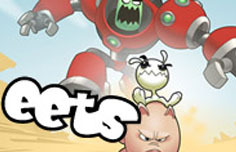 Eets is available now on Steam! Cortex Command is an AWARD WINNING multi-player 2D side scrolling action game with pixel perfect physics. Cortex Command is now also available on Steam! In the course of going about our business we've developed a spot of technology. A portion of it we'd like to release here for others to use. At this point in time it's not quite ready yet, so check back soon and we hope to have something for you then.